Ugh. Guys. This one's tough. If it were up to me I'd know everything always so I could prepare accordingly. That's reasonable, right? Ha! That's impossible. In life and business. As an in-house designer for small biz owners, I never really know at the beginning of each month how many projects I'll work on. Sure, I know what our retainer is and how much work that usually entails. But there are always surprises, extra projects, and sometimes no projects. Projects ebb and flow. And to be super honest, the ebbs make me really nervous sometimes! But it always works out. There are slow times and I'm learning to enjoy them, to take advantage of a free afternoon instead of worrying about what's to come. Because more will come. It always does. Secret bottom line? There are certain areas of your business you'll never be able to control. The sooner you accept that and dance with it, the better. You can never say for sure how many projects you'll work on in a month or how well your new program is going to sell or whether or not your online shop will become decorated with lovely sold out signs. At the end of the day, all you can do is keep going. Create work you believe in and enjoy this crazy amazing freelance / entrepreneur lifestyle. Don't let the unknowns freak you out. Want more secrety biz secrets? Catch up on this series here! Need a new logo ASAP and don't want to spend your vacation fund? The artsocial shop has gotcha covered. NEW LOGO IN THE SHOP! Guys. I'm preeetty darn excited about how this logo template turned out. Like too excited. Is there anything better than a good sans serif and some texture? This template is officially in the shop and ready to be adopted by a nice, caring business ;) If my logos were kittens I'd end up adopting all of them myself, ha! Remember, in the artsocial shop, all logo designs are exclusive. Meaning there's only one. Meaning it will be yours and yours only - wahoo! AND it includes one color and copy change by me. I wanna make sure you're 100% in love or else I couldn't live with myself. It's true. See it in all its glory in the shop! Money is a topic that comes up from time to time (ahem A LOT) when you're freelancing and solopreneur-ing. How much is your time worth? How much are your skills worth? Should you trade exposure for a project instead of money? Is it smart to say yes to a project to get "experience" even though you're making nada and spending hours and hours on it? It's tough! Don't get me wrong. I've battled (and still battle) with those money Qs. But I think 98% of the time*, DJ Quik had it right: if it don't make dollars, it don't make sense. This is your business after all. Respect that and others will, too. Put on your business hat and ask for what you deserve. No more trades. No more discounts. Because at the end of the day, if you can't make ends meet, your business isn't working. And that doesn't mean you should close up shop. It simply means you need to reevaluate your money-makin' plan. It's not selfish or greedy, it's smart. It's business. It's supporting your family. Having a money plan and creating a spreadsheet for income projections are important. Sure, it's not the most exciting thing in the world, but don't shy away from it. Get up close and comfortable with your finances. Love your money and it'll love ya back. * Of course, there can be exceptions to this rule. Sometimes it is worth trading your services or doing a project for exposure. For me it comes down to: am I excited about this? If you're excited about a project, do it. I've done projects that didn't pay a ton but I either had a blast or I really believed in the work. In those cases I'm glad I said yes. Like we talked about last week, listening to your intuition / gut / inner GPS is the only way to figure out if something is right for you. Now go make that money, boss! The next secret I want to share is a big one. It's something I practice on a daily basis, and something I feel I haven't fully mastered yet, if I can be honest - and I CAN. Cuz you guys are the best. Biz secret numero dos: Trust yourself. Artsocial wouldn't be a thing if I hadn't listened to my gut, my intuition, my instincts. Whatever you wanna call it, we all have an internal guidance system that's trying to communicate with us every moment of every day. I find I always get an instinctual feeling as to whether or not something is right for me. Have I always listened to it? Nope. Especially in the beginning when I was wanting to say YES to anything and everything to get experience. While there is value in practicing and building up your skills, if you know in your heart of hearts that a project isn't right for you - DON'T DO IT. I've learned that the hard way... more times than I'd like to admit! Secret bottom line? When you're making a decision about your business (or your life! ), get quiet and pay attention to how you feel about it. Does this decision give you butterflies? That's GOOD. Does it make you feel a little sick and your mind starts spinning with worries and doubts and questions? That's BAD. If you have a feeling it's not right for you - for any reason - that's your answer. You don't have to explain it or justify it to anyone - even yourself. It just doesn't feel right. That's enough. Move on. There will always be more work. There will always be more opportunities. Be selective and trust that you know what's right for you. Cuz you do, Bosslady. When a project first starts, the possibilities and ideas are endless. Ah! Guys, it's so exciting. Ultimately though, with every client and project, I'm always working towards that moment. When you see a design and you know immediately: yes. that. You can feel something click. We've got it. That's a wrap. This was one of several fonts I chose for a client recently. We ended up going with a different script, but I still have such a crush on this one! What do you think? Are you loving the hand-written font trend as much as I am? You guys. Big news to share today: IT'S BUSINESS TIME! Tiffany, Michelle, and I are SO thrilled to announce we're now accepting applications for It's Business Time, our 6-month coaching, branding, and design program dedicated to helping you claim your biz idea and create the platform to authentically offer it to the world. If you've been thinking about starting a biz or you have a business but it's just not quite working (yep I've totally been there, guys), It's Business Time will give you the clarity, structure, and accountability to make it happen. No more messing around. After spending 6 months with us, you’ll walk away with everything you'll need - a mission statement, offerings, a custom logo, and a website - to bring your business to life and hit the ground running. I am crazy excited to be a part of this and help others start an online business. I mean, I was there! I am there! All three of us walk the online biz walk. Three years ago I didn't even think owning my own business and creating my own success was possible. But here I am. It's humbling and exhilarating and I cannot wait to help others do the same. Ah! The program starts March 30th. There are only 10 spots available. Our acceptances will be on a rolling basis, so get your application in sooner rather than later. There's no obligation to apply. So why not, eh? This is the year for BIG things. I can feel it. And I can't wait. P.S. if you have any questions at all, leave a comment below or hit reply. Woot! Let's do this thang! While the design process is super exciting, there are two very key elements that must be worked out before the designing ever begins; before the pixels hit the page - ha! If the following puzzle pieces are in place for your business, the design process will be pure. magic. Your WHAT: get clear on your vision for your business. Your WHY: clearly define your brand. What's your mission statement? What are your values? How are you doing it differently than the other guys? After you pinpoint your vision and what your business does, it's time to ask how to define your vision so that your ideal clients will take notice. Knowing the answers to these seemingly simple questions is, well, everything right? Because the info above? Your what and your why? That's what makes your business, your business. It's the heart, the soul, the core. Only then can you tackle the HOW - the design and the website - in a way that truly resonates with you and that sweet, sweet biz of yours. Boom shakalaka(the sound awesome design makes). Images via one uh-mazing client's inspiration board. If you’ve ever felt the call to start an online business but aren’t sure of the what or the why or the how, It’s Business Time is a program with myself, Tiffany Han, and Michelle Ward to help you figure out all of the pieces and turn your Big Dreams into a Legit Biz (complete with a website designed by yours truly) in 6 months. On March 13th, we are hosting a free webinar called What We Want You to Know About Starting a Business. Sign up here to get the webinar deets AND priority application information for the program (only 10 spots available!). I'm such a fan of Squarespace. Probably their biggest fan. Challenge me, I dare ya. Yes, sometimes Wordpress is necessary. For 100% unique only-you-have-it sites, for complicated features and specific requirements, for customer portals and memberships - yes, Wordpress is the jam. But lately, I find myself recommending Squarespace for my clients more and more. Need an easy-to-use shop? Squarespace. Starting a business and need something gorgeous yesterday? Squarespace-a-roo. Need a secret blog for your new program you're launching? Squarespace it up, dawg. After thinking about it more, I landed on 5 particular reasons why I love Squarespace (and why you should fall head over heels for them, too). I don't know if you've perused the Squarespace templates lately (no? That's just my pastime? ), but their templates are so gorgeous and professional. Yes, it's a template, but with the right customization and some kickass, one-of-a-kind branding? It'll look like you've invested mucho dinero into your site. Guys this is huuuuuge, you know why? This means you don't have to hire a developer to change every little thing on your site. Hello, freedom! I am drunk with thee! Squarespace makes it easy peasy to make changes to your copy, colors, fonts, and general layout. They give you the power to make the changes you'll (definitely) be making as your business grows. Major win. 03 AWESOMENESS IS BUILT IN. E-commerce is available for all of their templates. 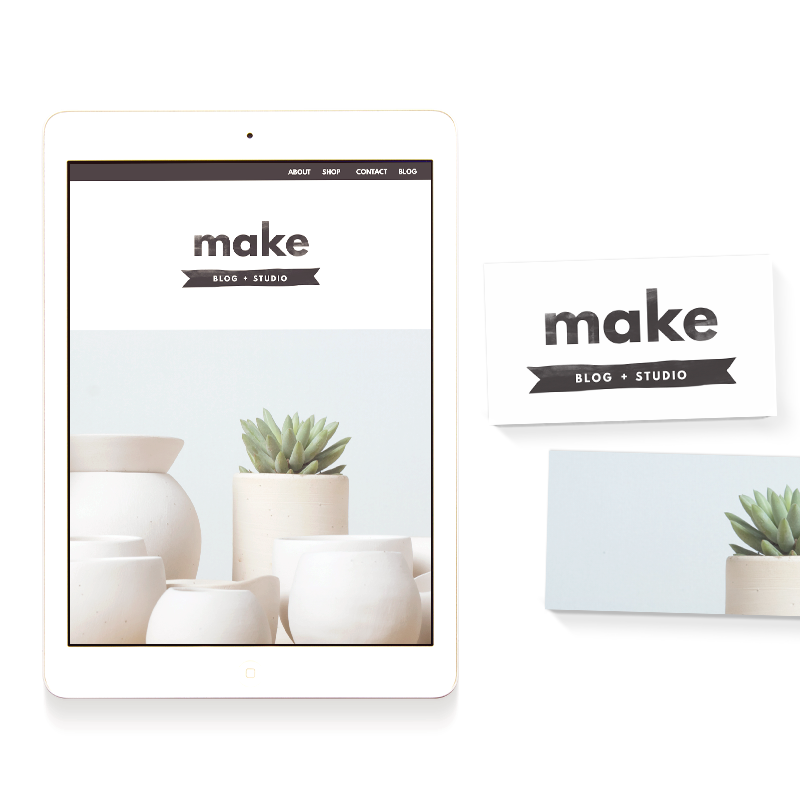 I set up my shop on Squarespace earlier this year and the whole process was so fun and easy. I think that's the moment I officially fell in love. 05 YOU DON'T HAVE TO TAKE OUT A LOAN TO BUILD A SITE. It's true. This is the biggest plus. You don't need to spend upwards of $8K to have a legit, amazing, successful website. When you're starting your business, invest in great branding, great copy, business coaching to refine your ideas, classes in your field - YES. Don't dive in by spending all your money on the site design. You just don't have to. Trust. P.S. if you’ve ever felt the call to start an online business but aren’t sure where to start, It’s Business Time is a program with myself, Tiffany Han, and Michelle Ward to help you figure out all of the pieces and turn your Big Dreams into a Legit Biz (complete with a website designed by me!) in 6 months. First up is a new social media template. A couple weeks ago I debuted a little secret weapon for us: templates sized specifically for instagram, pinterest, and facebook. This week's template is even more secret weapon-like, as it also comes with a twitter template. That's right. Let's share some twitter pics, too! Like the first one, it also comes with pre-designed captions using two of my very favorite fonts - I'm especially loving that script font right now! I want to put it on everything. Also in the shop this week is a new freeee template for February. This one is for all the round-up fans out there. Having a grid that's pre-designed for round-up posts has saved me a TON of time. It's definitely a must in my blogging toolkit. I hope it helps you, too! Guys. I'm starting a new collaboration + offering soon and my excitement is off the charts. I can't spill the beans quite yet, but I just had to give you a sneak peek of the moodboard I made for it! My method for moodboarding? I'll start collecting inspiration on a secret pinterest board and then try to distill it down to just a handful of pins, like you see above. With so much inspiration out there, it can be a surprisingly painful process. But every time I do it, I try to remind myself: the refining process is where the magic happens. And doing said refining with, say, a beer or a margarita? Totally allowed. I can't wait to share everything soon! Very soon.